In the original Summer Reading Program 2018 schedule, I listed Shinonome Yuuko Loves Short Stories volume 1 as the light novel we would read and then discuss around August 18th. Unfortunately, it turns out that volume was never fully-translated into English. I was under the impression that it was, but it looks like the fan translation project was dropped shortly before completion. I apologize if you started reading the book already, but I just found this out yesterday. For those who still want something to discuss, we will instead read volume 1 of Bokushinu, AKA Tomorrow, I Will Die. You Will Revive. (Japanese titles: Ashita, Boku wa Shinu. Kimi wa Ikikaeru. — 明日、ボクは死ぬ。キミは生き返る。) This series is written by Fujimaru, and illustrated by H2SO4. Synopsis: Born with a scary face, Sakamoto Akizuki has always been feared in his school. However, one night he witnesses a girl’s death. 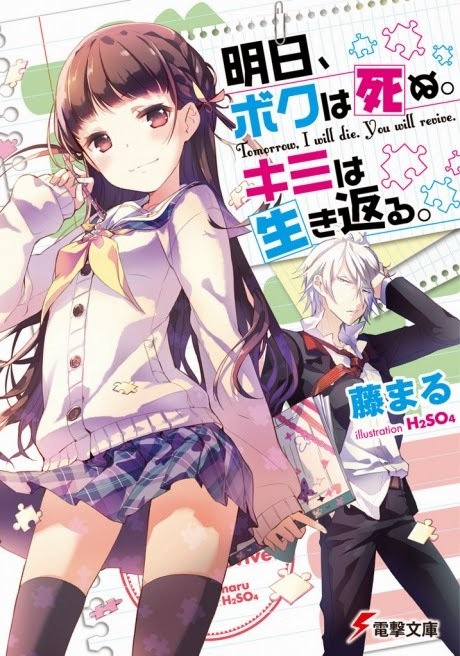 He is faced with a choice when he is asked a question by a mysterious person: “For half of your life span, will you revive her?” After following through with his decision, the girl is brought back to life–and thus begins the romantic comedy between Akizuki and the girl Yumesaki. Sorry again for the slip-up! I hope this novel will be just as interesting to read for everyone.